Let’s try an easy experiment that will dramatically show you how chromatography works. It won’t take long or require any specialized materials; probably you have these things around your house. First, get a clean sheet of absorbent paper. Then put separate spots of various colors near one edge of the paper. You could use water-soluble felt-tipped pens or food coloring. Now, roll the paper into a tube and place it into the glass with a little water in the bottom. Make sure that the colored spots are at least partly in the water. The water will be drawn up by capillary action, making the colors run. When you look carefully at the original spots, you’ll observe that the colors have separated into the primary colors of red, blue and yellow, which, when combined, make all other colors. This simple experiment will introduce you to paper chromatography. What actually is chromatography? Well, the two parts of the word define it quite well. “Chromo(a)-“ indicates color or pigment. “-graphy” means writing about or representing a subject such as art or science. Chromatography provides techniques for separating complex mixtures of liquids or gases, organic or inorganic substances, into their component parts. That’s accomplished by observing at what rates they are absorbed in different substances, such as a strip of paper (paper chromatography) or a column of silica (column chromatography) or gel. Chromatography has been around for longer than a century. A Russian botanist, Mikhail Tswett, developed the process just after the turn of the 20th century to study plant pigments such as chlorophyll. So, what else can chromatography be used for? Later in that century, chromatography was used to separate and study complex mixtures. Today, we use it for a variety of important scientific applications. Let’s take a look at some of them. Many branches of science use chromatography to improve our quality of life. Whatever scientific career you choose, you may encounter the use of chromatography. Two chromatographers were awarded Nobel prizes! Let’s take a look at some examples of scientific uses for this versatile tool that can be used for very small samples. Pollution monitoring—Environmental agencies often use liquid chromatography to monitor air and water, determining the composition and checking for dangerous pollutants, such as lead. Fish and wildlife—Agencies use chromatography to determine whether there are PCBs (polychlorinated biphenyls) in fish. Those manufactured chemicals can lead to negative health effects in people and wildlife that eat affected fish. Food industry—The food industry uses thin layer chromatography to detect pesticides or insecticides and other food contamination. Drug production—Pharmaceutical companies use chromatography to help develop new drugs as well as to monitor the purity and consistency of existing products. Pharmacists use it to determine the percentage of each chemical in products. Manufacturing—Chemicals used in manufacturing have to be within specific parameters to insure the quality of the end products. So, scientists can use chromatography to insure that the chemicals used in manufacturing meet the standards. Perfume production—This is one use that may not come to mind immediately, but when developing new perfumes and during production of existing perfumes, scientists can monitor the composition of samples to ensure consistent quality. Drug testing—Many companies require applicants to undergo drug testing, and laboratories often use a chromatograph for that purpose. Also, in case of an accident involving fatalities, the drivers involved are tested for the presence of alcohol or other drugs in their system. Hospitals draw blood from admitted patients, and they often determine blood alcohol level with those samples. Maybe you can think of even more examples of when drug testing is used. Forensic applications—If you’ve ever seen any of the CSI television series episodes, you may have seen the actors simulating the use of a chromatograph, although the one that they pretend to use is not the one that actually would be used for their purposes, but it looks better on the screen. 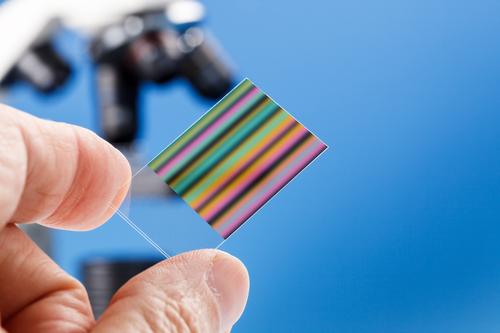 In real life, thin-layer chromatography is used for a number of applications in forensic science, including screening for toxins and poisons in the blood or dye in fibers for crime scene analysis. In short, the use of chromatography is so much a part of our world that you may even see it used in movies as well as the CSI TV series already mentioned. In “My Cousin Vinny,” gas chromatography results were cited in a courtroom scene. This use reflected an actual application that’s still in use today. However, some movies take literary license and reference things that are not scientifically accurate. Such is the case with Sean Connery, acting as Dr. Robert Campbell, who roamed the wild Amazon jungle in search for a cure for cancer in “Medicine Man.” Supposedly, he used a portable backpack gas chromatograph (neat idea, but not invented yet, nor does it seem practical). Only in the movies! Remember, dramatic presentations rely on our ability to suspend our disbelief to enjoy being immersed in the experience, so don’t look too closely. No matter the type of chromatography we’re considering, all depend on components moving through a substance, which can be called differential migration. At the conclusion of the process, we measure the differences in the distances and rates that substances move. The process involves two stages: the mobile stage and the stationary stage. The results come from measuring the point at which different compounds stop moving. At that point, they have separated from other compounds. Here is a brief introduction to the main types of chromatography. What types of chromatography are there? Paper chromatography—You’re already familiar with this type, as our initial experiment is based on it. Here, the mobile is the solvent and the stationary is the paper that’s placed in the solvent. As you have seen, capillary action moves the solvent through the stationary phase. Column chromatography—An adsorbent (a substance that absorbs another) is packed into a column, perhaps in a laboratory glass, and a solution containing the mixture is put on top. As the mixture travels through the adsorbent, components stop at different levels, differentiating them from the others. Gas chromatography—This is a type of column chromatography that uses gases as the mobile phase and components are separated by adsorption. The automated gas chromatograph is used in this process. But, as you've already learned, they’re not yet in backpacks. Thin layer chromatography—is used for non-volatile mixtures.A thin coating of adsorbent material is put on a plate or aluminum foil (stationary phase). A solvent is drawn up the plate by capillary action (mobile phase). We measure how far a compound travels by measuring the distance the solute moves and dividing it by the total distance the solvent moves. The resulting retention factor (Rf) is what we compare the values of a known compounds, showing whether they are similar or identical. So, whether you’re looking for a science project or a career, you might consider how chromatography could help.